Food | SURVIVE THE APOCALYPSE ! 1. Decide that you really want to lose weight. Sounds simple? Think: you must really, REALLY, want to lose weight. Accept the way that you are – that’s fine (and even essential for a happy life). AND accept that you ARE always changing and CAN always change. 2. Fix the date when to start – best is to start right away. 3. Choose a realistic target. I chose to lose 10kg at a rate of 500g per week. It turned out that I lost more weight and at a higher rate simply by following the steps below. 4. Determine how best to lose weight. There are many very informative and motivational websites with a lot of good tips. Do not rely on one site, but read as many as possible and compare the methods. The tricks below come from many website sources. 5. Weigh yourself each day, directly after you have gotten out of bed and gone to the toilet. Enter your weight into a graph. I used the Withings iPhone app to track my weight. Spend a few minutes each day to study that graph and to decide on your next steps. What went well? Why did your weight increase / decrease? What did you eat, how does that explain the curve? This will help you to understand the dynamics of weight loss, your body, your eating habits, your exercise, and ways to improve. 6. Reward yourself for milestones achieved. Obviously, food is not a good reward. 7. What to do if you are not losing weight consistently? Obviously, your body doesn’t want to lose precious fat. On top of that, your body becomes more efficient at making the most out of the food that it gets. You will thus have to further decrease the calorie intake, or increase the burn-rate. It is mind-over-matter: is your brain winning the game – or will you let your body’s craving and compulsions win? 8. 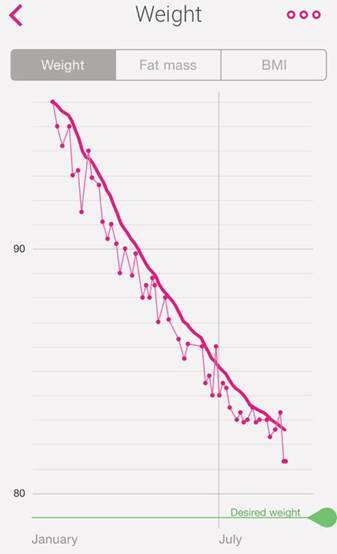 Fluctuations in weight (see my curve below) are normal. However, once you have gone down one kilo or one pound, the chance that you move up to your previous weight is reduced. 9. You are not dieting. You are changing your eating habits. For the rest of your life. That’s the beauty. 10. Eat breakfast like a king; lunch like a prince; and dinner like a beggar. Don’t eat anything between meals. 11. Eat big breakfasts, they can suppress hunger until 4 p.m. For example: 300ml fat-free yoghurt, 0-2 table spoons of shredded wheat, 200-300g of fruit (melon, orange, apple, banana…). Slice of bread. 12. Lunch: a big salad, no dressing, one spoon of olive oil, a dollop of fat-free yoghurt or mustard. Occasionally some noodles or a potato of some fat-free meat (I’m a vegetarian myself – which by the way does not have any effect on your weight or weightloss). 13. In between meals: coffee and tea are ok, but no drinks with sugar or milk. No snacks, no fruit. The sugar level in your blood has to go down to zero. This positively impacts insulin levels; and protects against diabetes. 14. Drink lots of water. Start with a big glass in the morning, continue drinking the entire day. 15. Dinner: the “watersoup-diet” kicks in: irony, folks. Try Japanese miso soup, a 1 liter bowl – which is almost free of carbohydrates or fat, so the only saturating effect is the liquid. Eat 250g of fat- and sugar-free cottage cheese (makes you feel full) with a teaspoon of cinnamon (great to support a weight-loss program – read about it on the internet) and optionally some lemon juice (vitamins + saturating effect). Keep busy; you feel more hungry sitting on the sofa. Move about, do some housekeeping. Go for a walk. This will make you feel tired, so you will sleep better. In emergencies, eat some salad, carrots, tomatoes or fruit. Obviously, if you are actually losing weight at the rate that you decide, you can also eat more than the above. You don’t have to starve to death. Nevertheless, a few evenings a week, your food intake must be very low, otherwise there won’t be any effect, which is not motivating. 17. Exercise. Walk 10000 steps a day. I have used the Withings Pulse Ox to track my steps and running. Go cycling, swimming, jogging, Nordic walking. Get your heart-rate up to 100 bpm for at least 30-40 minutes, three times a week. Start slow – you will automatically improve over time. 18. Some people say that you should never feel hungry during weight-loss, but if you want to see some result within a reasonable time, you will have to experience and enjoy hunger too. Hunger is not bad by definition. I felt quite hungry at times during the first three weeks. But then the stomach starts to shrink! Over time you will automatically need less food. 19. Next to obviously eating less fat, you must also cut the amount of carbohydrates. Try to avoid sugar and alcohol, in whatever form. The liver converts surplus carbs, sugar and alcohol into fat very efficiently. Read the labels on the food that you buy, compare products to see how much energy they give. 20. Build muscle. Even in rest, muscle burns calories. It is possible to lose weight – it takes willpower and a change in lifestyle. Don’t diet. Don’t listen too much to other people. Advice comes cheap! These benefits will help all to better survive the apocalypse.